Surprisingly good read, explains financial WMDs quite well, though thin on any in-depth analysis, and with a somewhat jarring and unneeded liberal bias. The book gives a good un-complicated overview of the financial crisis underway (New York Times article, Global financial crisis of 2008–2009 - Wikipedia, the free encyclopedia and Financial crisis of 2007–2009). It begins with the financial mess that the Whitefish Bay school district in Wisconsin found itself in because it had purchased synthetic CDOs without understanding them, from someone whose only claim to understanding these instruments was a two hour session on these instruments he had attended. The book then proceeds into a brief history lesson on money, and then goes into more modern territory, delving thereafter into the financial instruments at the heart of the financial meltdown. His prescriptions for fixing the mess are along familiar lines, like a steep progressive income and wealth tax rate, a tax on financial transactions of all kinds, a cap on executive compensation, etc... all are popular remedies, but how practical remains to be seen.Some are likely to see them as idealistic suggestions divorced from the reality on the ground, while some will see them as the vocalization of a leftist, liberal agenda, and some others will see them as watered down suggestions that don't go far enough. "You could start of take over a bank, attract lots of customers with your higher interest rates, dramatically expand the balance sheet with risky investments, spend lavishly on yourself, and yet be able to tell customers that their money was safe and sound, FDIC insured. It was a whopper of a free-market moral hazard." [page 49]. Sometimes an act of trying to protect the small investor can actually lead to very unexpected results. There have been at least two high profile books that have taken Alan Greenspan to task for his role in creating the financial meltdown of 2008 and 2009 (Greenspan's Bubbles: The Age if Ignorance At The Federal Reserve , Bailout Nation: How Greed and Easy Money Corrupted Wall Street and Shook the World Economy ), and this book also joins in, but he also puts Bernanke as belonging to the same thought-club. Derivatives, and esoteric, highly complex derivatives have been responsible for heaping massive liabilities on banks, financial institutions, and unsuspecting investors. These derivatives were never regulated. And never on the books of account of companies. Brooksley Born, chairperson of the Commodities and Futures Trading Commission, called for regulation of over-the-counter derivatives, as long back as 1988. And was fiercely opposed by none other than Alan Greenspan, along with Robert Rubin and Arthur Levitt. But it is not as if Ben Bernanke comes out much smarter. It does make you wonder just what kind of group-think was pervading the economic leaders in-charge when two successive Chairmen of the Fed believed in the same fallacy. While naked greed, on the part of both bankers and investors, drives risky investments, Chapter Five talks about Long Term Capital Management, LCTM, that took $1.5 billion from its investors, leveraged it manifold, and placed bets worth $1.25 trillion dollars, and in 1998, almost caused an international meltdown. When Genius Failed: The Rise and Fall of Long-Term Capital Management is an excellent book on LCTM and its rise and fall. Chapters Six and Seven are where the weapons of financial mass destruction are explained - CDO (Collateralized Debt Obligation) and CDS (Credit Default Swap). What is incredibly amazing is that ratings houses were convinced that the top tranche of these CDOs were so safe as to warrant AAA ratings. The book ends with suggestions on how to make systemic changes, and depressingly so, also acknowledges that real change may well be impossible, with so many vested interests at play here. A cap on executive compensation is not only sure to fail, but as current events unfolding make clear, has already failed. A tax on financial transactions is not going to work unless all nations agree to it, which makes the proposal a non-starter. Regulating derivatives is also not going to work, because the author states that these instruments are so complicated that any attempt to regulate would simply be circumvented by reworking these instruments as to escape any regulatory framework put in place. This is a short, readable book, with lots of well-explained historical background and context. It does a good job of explaining the financial instruments at the heart of the meltdown in a non-technical manner. It is a very good primer, but is somewhat marred by its jabs at the political right. 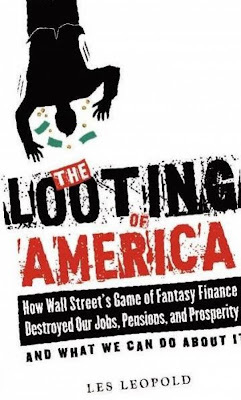 Les Leopold: Fear and Looting in America: Is Wall Street on Strike Against the Obama Administration?